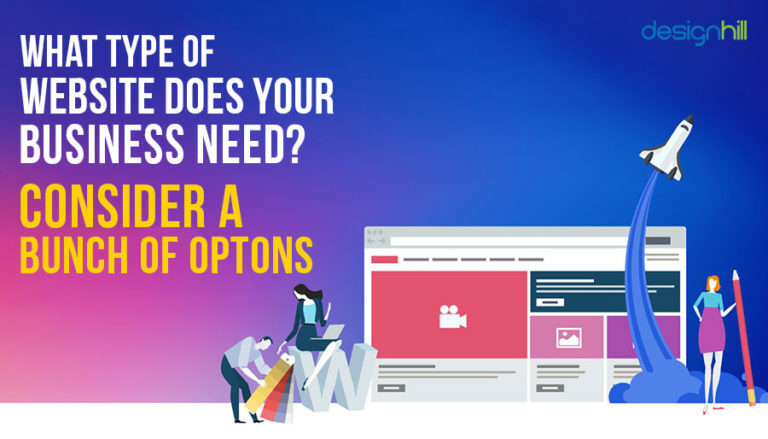 A common question that we often face when we build a website is what type of site do we require and will it suit the business? There are different types of websites. A website is not merely a website anymore. It can be used for a lot of things like selling products or services etc. A site can also be used for a combination of different purposes. Some websites have only a simple landing page that can merely represent the basic information about the business. Some are blogs, while others sell products or services. You will have to decide what kind of website is suited for your business. Then get on with the development process of the site. Remember, your casual approach towards website building can result in failing to establish brand identity. Choosing the type of website entirely depends on what you want to achieve with the site. One of the most basic and the simplest options of a website is a static business website. Web page design of such sites is very simple. Such websites are a more convenient option if you don’t require constant updates on your website. A static site only gets changed when you upload any content on the server. Here are a few things a static site should include: homepage with Call-to-Action, an ‘About Us’ page, Services, Mailing Address, Primary Contact Details, and some images related to the products/services or office. A static site is cheaper and easier to maintain than other websites as it doesn’t require a frequent update. One of the best ways to build customer loyalty is to offer information about your products or services to your potential customers. You can use the power of blogs to connect with your readers, requesting them to subscribe to your blog. Several sites these days offer easy ways of blogging. There are many user-friendly themes available on these sites which only require you to add text and images and start publishing. There are both paid and free blogs available. You can yourself build your blog site, and you don’t need to hire a graphic designer. However, you can make your blog site more useful by paying for it. You can use the blog either as a part of an already existing site or it can work as a standalone site. Your blog will need to well-formatted in case most of your work is done using your blog. Be creative to create a more attractive, exciting, and informative blog for your users. A site where you can put your products or services for sale and accept payments against purchases is an e-commerce site. An online store is a good option as you can get in touch with a broader audience base and turning them into potential clients. These kinds of sites should be dynamic to sell the products. An e-commerce site requires constant updates as there is a continual sale of products and there are also changes in the inventory. One of the best options to build an e-commerce website is WordPress as it is an open source and offers various useful plugins. You can also incorporate several different types of plugins in these e-commerce sites. A good e-commerce site requires good encryption and comprehensive tech support. A portfolio site is essential for you if you are an artist or a software developer. A portfolio site can prove to be one of the best things as you can use it as a resume of your past projects. It can be immensely useful when you need to showcase a variety of work on different projects while using a single platform. To be more convincing, you can also prepare a list of skills and think of ways you can demonstrate those skills in the best way. You can also upload video or audio clips, testimonials, press releases, media coverage, written content, etc. on such site. A brochure site or a catalog site is a mix of different formats like portfolio and e-commerce sites. The significant difference between both is that on a brochure site you can see and read information about the products in detail but can’t purchase those directly from that page. Brochure sites are perfect for those who offer highly customized products or services. If you have graphic design ideas, you can make your site more attractive, by sharing ideas to the graphic designer. A brochure can be useful in a way that it can help you showcase different categories of your product and services. It gives a detailed account of each product that you have to offer. The same brochure site can also be used for standard products as well. Online ordering sites have become more common nowadays, especially for fast food chains and restaurants. It is similar to an e-commerce site. Online ordering site can be used as a way to build good customer loyalty. A customer ordering plugin can be used along with your online menu.Third party sites like Yelp and Eat24Hours also allow you to register with them. A third-party plugin can also be used depending on the host your website is hosted. Just like blog sites, question and answer sites are similar in the format; but they are two-way and more interactive. On this site, you can ask questions and expect answers to those questions. The answers can either be from an in-house team in place or from people in the community who are ready to volunteer by answering those questions. It is an excellent way to encourage people to come together, communicate, and share useful information. The site works like a social media site which requires being dynamic as it will have to incorporate constant updates and changes. After a certain period, the files can grow in size and make the website slow. This is why you need to maintain such sites on a regular basis. Even educational sites are similar to blog sites. Educational sites can be enhanced by improving the kind of content that you are offering on the site. You can incorporate images and videos into the written content to make them more informative. Uploading a video of a lecture or holding an online class with students watching it from around the world can also be extremely helpful. Also, don’t forget to create a logo for your site that can grab the viewers’ attention. Educational sites are also capable of offering full-fledged courses that have a definite timetable and schedule. The goal of an educational website is to provide education and information. Educational sites are a bit difficult to maintain as they require constant tech support. Google AdSense allows you to place ads on your website. It is majorly used by bloggers to earn additional income. But Google AdSense is also primarily used by others in a way that it adds to their primary source of income. If you already have a website that others are using, then Google AdSense can prove to be really helpful. The application or the tool can be offered free of cost. Whenever the user visits the website, they will notice an ad and will be enticed to click on it. Achieving the perfect level of a Google AdSense site can prove to be a bit tricky. Your website should stand out in the way the ad is presented, and the layout is done. You might also chase away potential customers by placing way too many ads. A site that can generate income by the affiliate selling of products or services is called an affiliate site. Using an affiliate link, you will receive a specific commission whenever a purchase is made using that link. Bloggers make use of affiliate marketing as an extra source of income. The main focus can be on offering useful content around your affiliate links to focus more on them. The biggest drawback of such marketing is that it took a long time to generate income. You will be required to generate an audience base that will trust you to purchase your product and service. Success will also depend a lot on your marketing strategy. Now you can choose a site of your choice which is suitable for you, depending on the type of business. The selection of site is majorly inspired by what kind of products or services you are selling. Make the usage of right keywords and use them in all the right places only. Choosing the right keywords will only help your site get better visibility. When someone is looking for a product or service on the search engine and if they type the keyword, your website will appear faster. Keywords play a significant role in how Google perceives a website. Also, how it is presented in the Google Search. For more information, our expert professional will help you to maintain your site or get in touch with any questions you have.